Read about all the programs or skip to the section you want to read by clicking on the links below. Credit unions have always made a difference for the communities they serve through deposit offerings, loan programs, branching options, and more. Today, some are pushing beyond traditional loan products to fulfill the unmet or evolving needs of members. The credit unions below have developed small-dollar and niche loan products that have an impact on members’ lives that far exceed the dollar amount of credit extended. From helping members become citizens to helping members become families, these cooperatives found ways to serve a distinct need in their membership. DCU’s Quick Loan, which is available for amounts ranging from $200 to $1,000, helps members cover emergency or unexpected expenses without charging excessive rates or fees. DCU introduced the loan this summer and members can access it only through the credit union’s online banking or mobile app. Black Friday Deals. Anytime Of The Year. “Our board and senior leadership team are focused on improving the financial health of our members,” says Craig Roy, senior vice president of retail lending for DCU ($8.6B, Marlborough, MA). The credit union is committed to providing educational resources as well as access to affordable products. When DCU examined how members manage their financial lives, it found they use payday lenders and even pawn brokers — despite the exorbitant, triple-digit rates these institutions charge. The discovery led to the creation of the Quick Loan. DCU’s launch strategy for the Quick Loan started with meeting members where they already are. “We do a lot of pre-approvals already through our loan suite, which is accessible through online banking or the DCU mobile app,” Roy says. After members log in to the loan suite, they see their pre-approved loan options. Accepting a Quick Loan pre-approval offer is simple, and more than 80% of the loans DCU has booked to date have automatically closed and funded with no staff involvement. As an added benefit, funds are typically available within 24 hours or less. The initial launch has been quiet, but DCU intends to promote the Quick Loan more heavily as it gains more experience with the product. “We want to make more members aware through outreach and by looking at data that suggests which members might have predatory loans elsewhere,” Roy says. DCU booked more than 1,200 loans totaling more than $1 million within the first 10 days of launching the Quick Loan. Most of these borrowers have another DCU loan product, an average of $500 per week in direct deposits, and a mid-500 credit score. Above all else, Roy recommends keeping in mind the core members the credit union is trying to help. For example, members using payday lenders or pawn brokers likely have credit challenges, possibly even bankruptcies. Credit union leaders should also be realistic about default rates and consider reserving differently for these types of loans. “We charge 22% on these loans, which is higher than our other options but still a fraction of the 200%+ charged by predatory lenders,” the SVP says. Lastly, Roy encourages other credit unions to pay close attention to proposed regulatory changes, such as PAL II, which might impact payday loan alternatives. Unlike PAL I, there is not a UDAP exemption from the CFPB. In its comment letter to the NCUA, DCU urged the regulator to address that issue. Looking For Answers About Your Loan Portfolio? It takes minutes to compare various aspects of your lending portfolio to other credit unions with Peer-to-Peer. Let Callahan & Associates walk you through your numbers with a custom performance audit. Seattle Credit Union’s two citizenship loans help cover the costs associated with the process of becoming a U.S. citizen, including passport fees, DACA (Deferred Action for Childhood Arrival) fees, and TPS (temporary protected status) fees. Seattle Credit Union ($857.6M, Seattle, WA) introduced the Citizenship Express and Citizenship Plus loans in June 2016 in partnership with the City of Seattle’s Office of Immigration. Throughout the year, the city hosts citizenship events to review the process, answer questions, and provide legal representation. The credit union attends to offer help with financing. The credit union offers two citizenship loan offerings to provide flexibility and better financing. Citizenship Express loans are available for up to $725, whereas Citizenship Plus loans are available for up to $4,000. The credit union has adjusted this needs-based loan program to help cover DACA or TPS fees and offers members a choice between paying traditional interest or an upfront fee. Although this portfolio is small in comparison to its other products, Seattle Credit Union’s overarching goal has been to serve its community and demonstrate its support. A key takeaway the credit union has learned is that providing education is of the utmost importance when it comes to serving underbanked or unbanked members. The lending executive also advises credit unions to be open to serving no-credit or limited-credit members by adopting flexible underwriting guidelines. Verity Credit Union’s bicycle loan is part of a larger sustainable lending initiative that also includes solar and green auto loans. The trio all contribute to the credit union’s triple bottom line by helping Verity serve its members, create local prosperity, and nurture the planet. Verity has offered bicycle loans for quite some time, but the credit union relaunched the niche product in mid-May, according to Tina Narron, chief lending officer for Verity Credit Union ($561.4M, Seattle, WA). “One of our branch managers and our CEO are both avid cyclists,” Narron says. 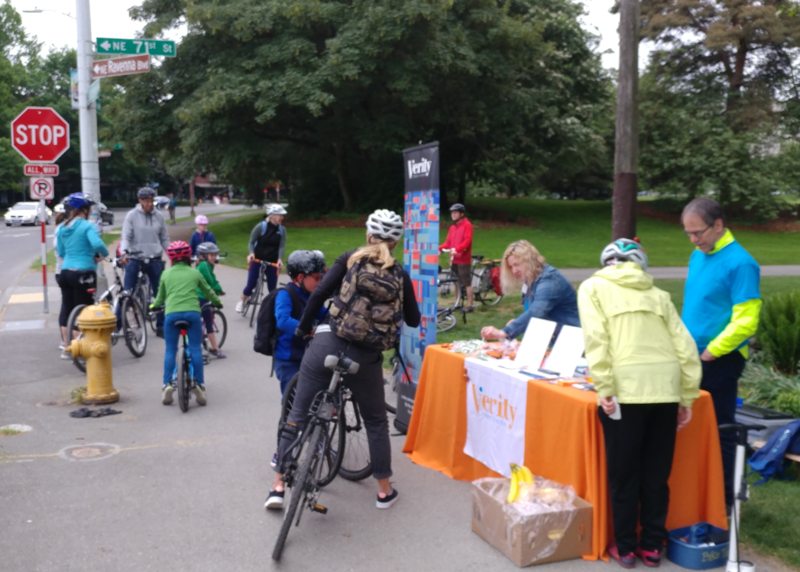 Verity participated with Seattle's Bike Everywhere day with booths in two different locations. The day is dedicated to promoting safe bike commuting and awareness, and Verity promoted its relaunched bike loan. The credit union has been reconnecting with bike shop vendors and participated in Seattle’s “Bike Everywhere” day on May 18, 2018. But the underlying force driving the resurgence of bicycle loans is sustainability — Verity Credit Union recently joined the Global Alliance for Banking on Values. “We’re measuring how much of our assets are going to a triple bottom line — serving people, planet, and local prosperity,” Narron says. Bicycle loans support sustainability along with the credit union’s solar and green auto loan programs. Without offering any sort of paid incentive, Verity partnered with nine local bicycle shops that now offer credit union financing. “We’re just going out and building relationships,” Narron says. Verity’s bicycle loan offers rates as low as 5.99% APR for up to $10,000. Street bikes on average cost $1,000 to $1,500, but many specialty bikes can reach the maximum loan amount. “If someone needs financing, we have affordable options,” Narron says. In its bicycle portfolio alone, Verity has booked 30 loans for a total of $60,000 since re-launching the product in mid-May. However, its overall sustainable lending program includes approximately 1,280 loan accounts that total $21 million. These balances include Verity’s popular solar program, which the credit union introduced a year ago, as well as the green discount auto program. She also recommends experimenting with different solutions and recognizing that not every pilot program will be a success. Firefly Credit Union’s Adoption Loan provides a much-needed, low-cost financing option to cover up to 90% of the costs associated with adoption, which can range from $5,000 to $45,000. 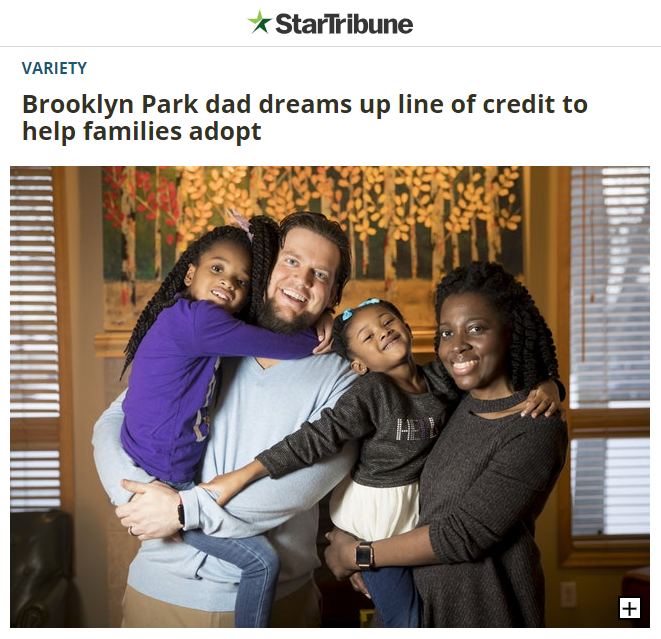 Minnesota's Star Tribune ran a piece in early 2018 about Geoff Bullock's adoption experience and the adoption loan from Firefly Credit Union that followed. Read it here. When Firefly Credit Union ($1.3B, Burnsville, MN) launched its Adoption Loan program in February 2018, the credit union didn’t expect the niche product to have such a big impact or attract such local press coverage. But the credit union’s own community engagement and education specialist, Geoff Bullock, knew from firsthand experience what a powerful loan this could be. Bullock’s family was able to scrape together the money, but he recognizes the challenge other prospective adoptive families face. Firefly Credit Union looked at the need for adoption financing from the borrower’s experience — not knowing exactly how much the fees and other expenses would total — and created an affordable, lockable line of credit. The loan is an unsecured line of credit, which offers lower rates than many signature or personal loan options. And Firefly deposits a welcome gift of $500 in the new child’s savings account. Despite the multiple agencies involved and long waiting period that are common in the complex adoption process, the credit union has had seven families book loans so far. Six are for domestic adoptions, and one is for an international adoption. The credit union is now working closely with adoption agencies and has begun expanding its network. For their part, the borrowers are promoting Firefly within their own networks. What makes the loan a standout is the fact there aren’t many true adoption financing options available. Firefly’s program is a stand-alone adoption loan with a low rate and no collateral. “It’s easier than it looks,” Bullock says. The credit union leader admits creating the product was daunting at first, but the process went more smoothly than expected. And the loan has made a significant impact. For years, Ironworkers USA Federal Credit Union ($29.7M, Portland, OR) has offered tool and dispatch loans for apprentices. “It’s something we’ve done to help them get started,” says Teri Robinson, CEO at Ironworkers USA. The tool loans top out at $300 and are based on the individual need of the member. Some apprentices require special tools; others need short-term financing to get to the job site. The credit union works closely with the labor union, which tells workers in need of financing about the loan option. The credit union has set an interest rate of 18% and requires a $25 application fee for the loan, but it works with members to craft highly personalized, manageable repayment terms. The credit union makes, on average, three to five tool or dispatch loans per month, which borrowers repay within a few months. “The loans aren’t a big part of our total loan portfolio, but we find that our members make good money but are not always good money managers,” says Robinson. That’s why the credit union has personal conversations to ensure members understand that the money isn’t coming just from the credit union, it’s coming from their co-workers who participate in and own the cooperative. That kind of education adds a little peer pressure to repay the loan. With finance companies charging huge interest rates and predatory fees, it’s time for credit unions to step up and serve 100% of their members, Robinson says. “We need to open our eyes, especially about payday lenders,” she says. The CEO advises credit unions to use member data to identify and reach out to members who use predatory finance companies. Credit unions need to focus on saving members money and helping them avoid the traps of fast cash convenience, Robinson says, not on internal industry competition.